Since February 2000 it has been possible to travel abroad and take your dog with you, as long as he has his ‘pet passport.’ Many countries now accept dogs under the pet travel scheme, but check just in case the country you intend to enter is not covered. It can take 6-7 months for a dog to qualify for its passport so you must plan ahead. Your vet will be able to assist you in most of the requirements however it is your responsibility to ensure that all is in order. Your dog must have been micro chipped. This is a very small device that is inserted under the skin normally around the shoulder area; it holds electronic information about your dog and his ownership. Make sure that the microchip inserted in your dog can be scanned and read. If the chip cannot be found or scanned your dog will not be able to enter the UK and could end up in quarantine for six months. There have also been instances of chips migrating to other parts of the body, so ask your vet to scan your dog occasionally to check that all is well. Your dog has to be vaccinated against rabies and booster injections must be done at regular intervals. Your vet will perform blood tests in order to see that your dog has the required level of rabies antibodies in his blood. If it is found that there is insufficient immunity then another rabies shot is given and further blood tests are done after thirty days until your dog is immune. Once the dog has a positive blood test, the vet will arrange for a health test and if he is happy with your dog, a passport will be issued. The passport lasts for the life of the dog but regular rabies booster shots must be done or you will start from scratch with blood tests. When you return to the UK you must ensure that your dog has been treated in the last 24 – 48 hours for tapeworms. This will be shown on the passport by the vet administering the drugs. If in doubt about how to find a vet who will carry out this procedure contact the Department for Environment Food and Rural Affairs (DEFRA) who will advise you. If you are driving abroad check that the port you intend to travel through does accept dogs under the pet passport scheme. 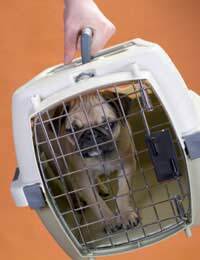 If you intend to fly from a UK airport your animal shipping company will have details. There are some other animals that can also travel under the pet passport scheme. At present dogs, cats and ferrets are allowed to travel but as DEFRA are updating rules regularly it is worth enquiring if you have another pet that you wish to travel with. Once you have gained a pet passport for your dog you will be able to experience dog shows and traditions around the world. The scheme has also opened up the opportunity for overseas dogs to visit our shores and compete in the UK.